By Shahid Khan This Sunday on 17th February, 2012, I had a privilege to partake in First Lent communion service in Wellington Church of Scotland, in Glasgow. The very experience of “Sharing the bread” with the other faithful was a refreshing and invigorating experience in my life. Lent is known as the “preparation” period for something bigger which will end up in the greatest triumph ever in a human history – Victory over death. It is also the time to make our lives available for “others”. This is the theme to remember while we share the “bread of life”. Poverty and hunger ruins human life on a larger scale. According to UNICEF, around 22,000 children die every day. Every second child in the world lives in abject poverty. The dearth of basic amenities in life, like clean water are denied to millions of children in some developing countries of the world. They become silent victims of these rampant vices in our world, being the weak and the meek they are more invisible in the death statistics. Their housing conditions are deprived of any basic facilities, no proper sanitation which is a hot bed for multitudes of diseases which culminates in the death. 2013 is the year marked to alleviate poverty around the world. The massive opportunity and responsibility lies on the developed countries where giant food markets are superfluous with all kinds of food which can be spared for the hungry and the needy in the world. According to the Food and Agriculture organization (FAO) about one third of global food is either lost or wasted annually which means that rich countries of the world waste around 220 million tonnes of food. The life of Jesus, who manifested care, courage, and compassion to the people he lived with, is a glaring and glorious example of “Loving thy neighbour”. We as Christians are called to care and look out for the poor and the needy. We need to make sure that Lent is the time where we rediscover the ageless characteristics of Christian life and beliefs. The opportunity and the privilege of being beggars “At His Table” is the yet another reminder of the compassion and undying love of God who has given us the opportunity to share in his life, grace and abundance which enrich our lives. In the same manner it is our duty as Christians to look out for the ways which we can reach out to the communities in our neighbourhood and make a difference just like did while he walked in the streets – proclaiming the good news, and providing the food for the needy and the poor. This Sunday First communion service touched my heart to make difference in the lives of people by reaching out to the communities, who are dogged by the abject poverty, and denied with the basic facilities of life like clean food, sheltered homes and those millions of children across our world who do not have access to the education and etc. We need to make steps at the right direction a) raise awareness b) to plan c) to give both time and money for the good causes. There will be no poverty in our world and no one will die with hunger only if we only start using our resources in a proper manner where everyone gets the share, where the divide between rich and poor is bridged by equality and where justice rules like good king in his kingdom who makes sure that his subjects are all well fed and taken care of. Unfortunately we live in times and age where many things in our lives are not shared. We rather grow up with in “unshared culture” or some of us are drowned in the sea of “my things”. As humans, we love to live in the bubble that as long as I am all well-fed, happy, not persecuted, undisturbed with social-economic vicissitudes of life “All is fine”- we remain unaffected with the tsunami of problems across the world which rock the lives of millions of people affected by such problems daily. These soaring problems remind us the “responsibility we need to undertake in curb these problems of the world. “Sharing bread” in our world is a great idea for a life as we go through the scarcity of food in the coming years.Shared- interests, Shared-lives, Shared problems pave the way for the better world we all yearn to see. The Lent is the reminder of all what we can do and invest in lives of “others”. 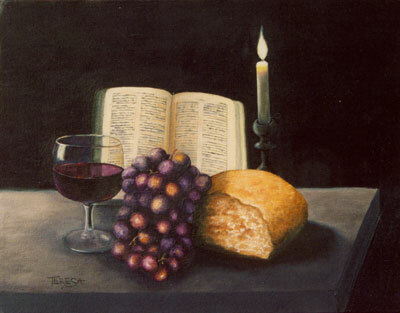 The privilege of sharing the bread and wine “At His Table” lasts forever, provided we empty ourselves and pledge to make difference in the world, which He once died for. This entry was posted in Articles, Spiritual Articles and tagged Christian, Christian articles, Lent, positive thinking, Reports, Shekinah. Bookmark the permalink.